KEVA planks appear incredibly basic at first glance – they’re “just” wooden blocks. Unlike many other construction sets, KEVA planks do not have connectors that join the pieces and there is no glue required. Each piece is the same size, roughly 4 ½ inches long, by ¾ of an inch wide, and ¼ inch thick of beautiful wood. 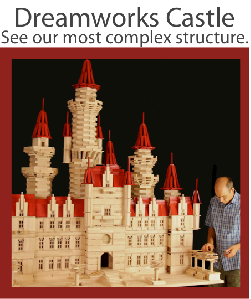 Yet it is this simple design that allows people of all skill levels to assemble amazing complex and stunning structures, by simply stacking the planks atop one another. Because there are no thingamajigs, widgets, or doodads required to complete a project, KEVA planks allow kids to build with their imaginations instead of with intricate blueprints. Kids can begin building immediately and it makes clean up a breeze instead of a chore. No need to search for that one essential piece of the kit that always seems to be missing, and there is no need to separate and store the pieces in separate bins. The simple design also provides powerful educational opportunities for students of all ages. For academic learning, KEVA planks can be used as science and math lessons that children can touch. Through “playing” with the blocks, younger kids gain a fundamental understanding of geometry, gravity, force, equality, balance, and a real, physical sense of numbers. And older students can participate in a living physics lesson through a variety of projects, including building a turbine, a trebuchet, or a striking sculpture that appears to move. But KEVA planks do more than teach traditional academic subjects in a novel way, they provide learning opportunities for social and emotional growth as well. The larger projects are great for kids with speech and behavioral challenges, because they require communication and teamwork, encouraging all kids to speak and listen for understanding to work effectively together. These projects are often created through simple repetitive patterns, which allows kids at varying levels of skill to work together. And these projects are the perfect way to enjoy Family Fun Night together. Unlike board games that are designed for specific age groups and skill levels, the possibilities of KEVA blocks are limitless. From pastoral villages, to intricate dollhouses, to medieval castles, to towering skyscrapers, or avant-garde works of art – the entire family can join in creating a new project every time you bring them out. Parents and kids get on the floor together, working as a team to plan cooperatively and actively create. And although you will all feel a true sense of pride and ownership in what you have built as a family, half of the fun of playing with KEVA planks is the destruction phase. There is a true sense of satisfaction that you only experience in toppling down an enormous building made of blocks. In fact, many people love to build “self-destructing structures” that are designed to fall down in a domino-like effect. There many reasons KEVA planks are such a huge hit with museums, schools, and homes across the country. Homeschoolers will love the cross-curriculum themes, allowing them to incorporate art, culture, history, geography, and so much more. Although they appear incredibly simple, even the most sophisticated imaginations are captivated when creating with these blocks. The KEVA planks company was founded by a homeschooling family, so they have a special understanding and appreciation of homeschoolers. They provide the same deep education discounts for homeschooling families as they offer to public schools and libraries. The founder, Dr. Ken Scheel, is a STEM and informal learning consultant to public schools and museums. He happily shares his lessons and activities with homeschoolers at no cost. To obtain educator discounts e-mail info@kevaplanks.com and mention this article.